In an effort to reduce medical campus traffic congestion and delays that are affecting patients’ abilities to arrive for appointments in a timely manner, please be reminded of the designated locations for passenger drop-off and pickup, as well as food vendor deliveries. All faculty and staff members who are being dropped off or picked up at the medical center by private vehicles, corporate shuttles, Uber/Lyft services, limousines and taxis, should only utilize E. Hospital Drive, outside of the UH South Hospital South Employee entrance between UH South and the Simpson (P4) parking structure. Please see the map to the right for the appropriate location that is designated in UMHHC Policy 05-03-055. The front entrance to the Taubman Center, Children’s and Women’s hospitals and the Rogel Cancer Center should not be used for any staff drop-offs or pickups, as these “stops” cause traffic back-ups which delay patient and visitor arrivals for care services. Please be advised that vehicular drivers waiting for pick-up at an entrance that is not designated by the policy will be directed to move to the designated location on E. Hospital Drive. Employee entrances at the Cancer Center, C&W, and CVC are still available for those arriving on foot or on a bus. 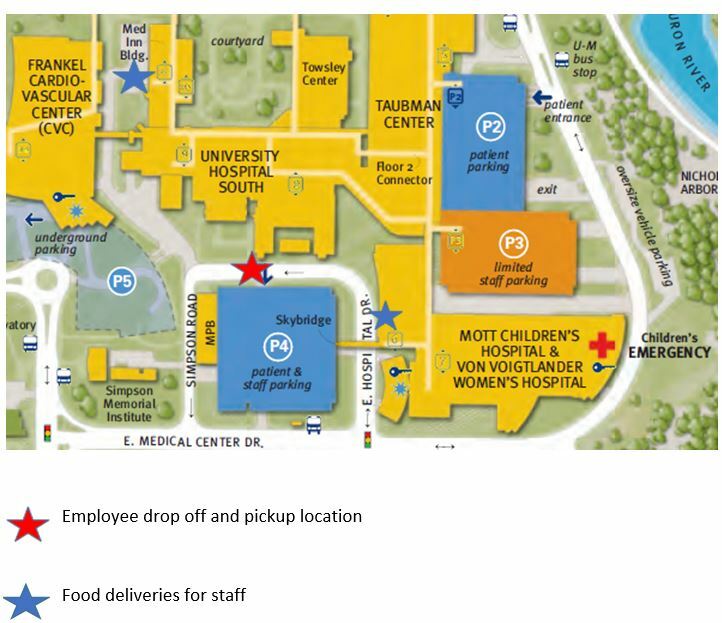 Food vendor deliveries for staff can be made at the Med Inn west revolving door, the UH South employee entrance or at C&W in street parking spaces just past the main entrance. It is very important that food deliveries not compete with patient and visitor traffic flow. 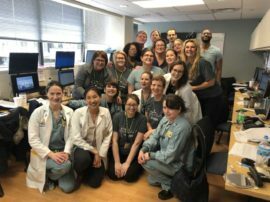 Thank you in advance for your cooperation and participation in improving patient and visitor arrival experiences while seeking care and service on the main medical campus.